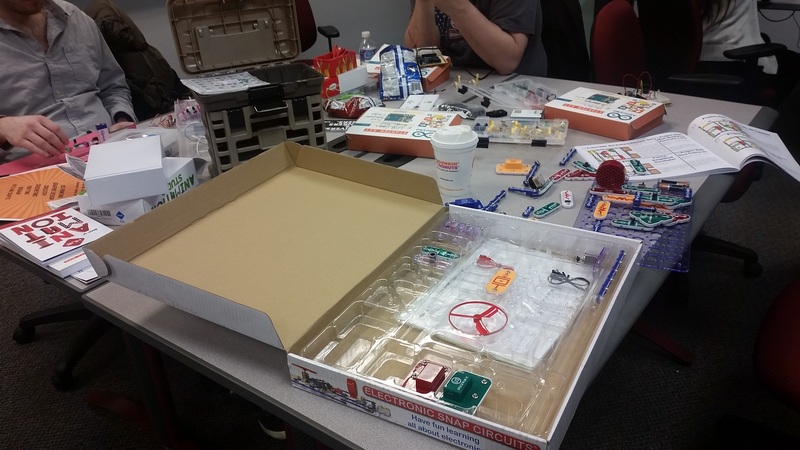 This guest post, part of a series, comes to MakerBridge from Terence O’Neill, Entrepreneurship Librarian at Michigan State University. We’ve been lucky enough to feature content from Terence before on our blog. Check him out on Twitter @EntrLibMSU! Makerspace as a term is only six or so years old. Over that time, the definition has continuously gained shape, incorporating influences as different as design thinking, hands-on education pedagogy, and electronics hacking. Even now, the term is open enough for dramatic interpretation, yet there are still common threads that you can see run through all makerspaces: expressive technology exploration, in community. Recently, I toured the online materials of all self-defined makerspaces in U.S. higher education libraries, trying to get a handle on what developments are taking place in makerspaces.. Two commonalities across spaces were 3D Printing as a technology and ‘Innovation’ as a stated goal. There were also significant the points of divergence and sets of choices: inclusiveness/culture, technology, and service design. In this post, I’ll write about the first, inclusiveness/culture, and then in subsequent posts I’ll address technology choices, service design, and particularly how these different choices interact. How can a space foster the type of close collaborative and interdisciplinary relationships, but also be open enough to not be exclusionary? Particularly in open and discipline-agnostic libraries, can you provide the on-ramp to awesomeness that makerspaces promise to everyone? At what level of depth? What I found was that spaces tended to operate on a tradeoff—they either looked to serve a set of concentrated users, and let them engage with the space and each other, or they looked to serve everyone, but had to maintain order so that the next group or individuals to use the space were able to engage with the space. I think that the makerspace ideal is something along the lines of “open all the time, for all of the people, with all of their projects!”, but there’s an inherent contradiction there. If you’re open all the time, like let’s say some of the hackerspaces like Pumping Station One in Chicago, you likely have significant measures (key card/fob access, membership, required training, etc.) to actually limit the flow of people and ensure some level of security to the people and projects that are using the space. If you limit the people that have entry, you create the chance for people to leave their projects out. This is mostly an assumption on my part, but the greater sense of community the less likely theft is. Spaces with specific users and project visibility between users would also increase the chances of collision—people from different disciplines seeing and interacting with each other’s work. However, this sort of specific community might lead to sentiments of “that technology and space aren’t for me” that makerspaces are both meant to address and often struggle with. 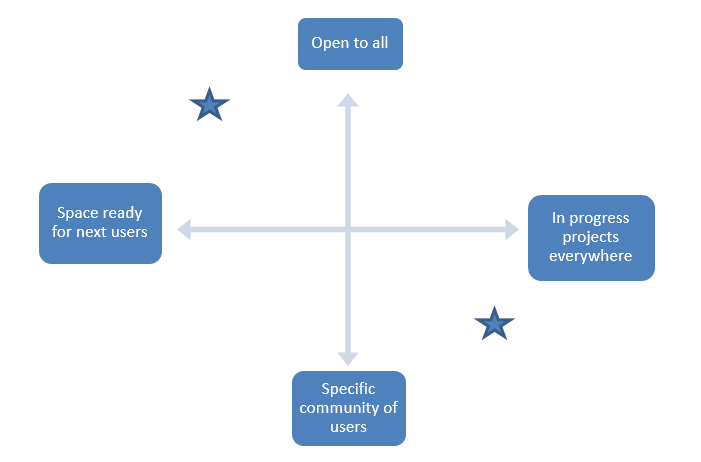 Some spaces strive for the middle point by requiring training and / or online education, but opening access to anyone upon completion. On the other continuum, the midpoint for how messy a space can be might be lockers—you must be able to move your stuff out of the way. As always, context matters. If you’re in a low-traffic area, you might be able to have a low barrier makerspace that still allows for a distinct community. But many makerspaces will encounter this choice: what type of makerspace do you want to have, one that serves a specific group of people and allows them to engage deeply, or one that serves a greater number of people? Who do you want to serve? I don’t mean to say that the midpoint is the absolute best, or that you need to have an exact persona in mind for your end user, particularly when you start. I find that in the space I work with, Make Central at Michigan State, we have started in the top-left corner, while other spaces on campus tend to populate the other regions of my simple chart. Meanwhile we are experimenting with how to provide for deeper engagement with specific groups while maintaining an openness that other campus spaces cannot. Ideally, we will get people started, and help them find the spaces where they can more deeply engage. Does this sense of a tradeoff resonate with you? I’m very interested to hear if other people see their culture as partially defined in this way. In my next post, I’ll talk about the technological choices that makerspaces make.